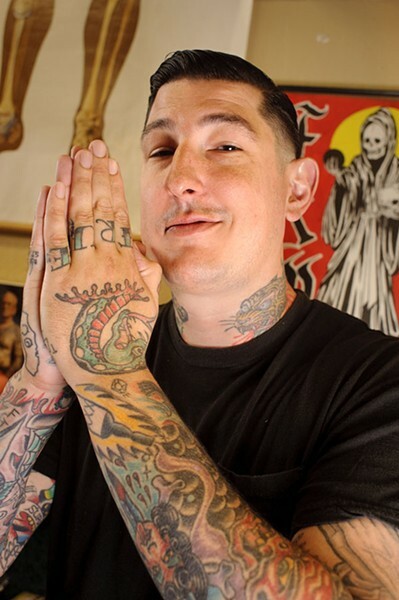 Chris Duffey Best Artist for Tattoo Virgins: Chummy Alexanian. Everyone and their mother has got a tat nowadays, but for those who haven't yet taken the plunge, Chummy Alexanian at Tattoo 13 is the man to see. Covered himself in tattoos of all kinds, tall and broad shouldered — like some kind of parallel ink universe football quarterback — Alexanian has been engraving clients for more than ten years, and can do anything from simple designs (think stars and butterflies) to the really complex (machine guns exploding on an upper arm, a back covered in roses, or one of Maurice Sendak's Wild Things on the smooth skin of a calf. Whatever). Tattoo 13's macho vibe might seem intimidating, but Alexanian sets clients at ease with light banter that makes the actual carving seem like a walk in the park. (Well, not exactly ... it is a needle, folks.) And better yet? According to Alexanian, his name comes from an ancient Armenian dialect and translates to "artistic warrior who overcomes all adversity." Perfect.